« Out With The Mini – In With the Maxi! Ask Judy: How Should I Balance Breastfeeding And Starting Solids? Dear Judy, How would you suggest balancing breastfeeding and solids once my daughter is ready to start on them? I assume because the solids would be so small at first that she’ll be breastfeeding probably just as much as she does now, but once she starts really eating a lot, how do I determine how much solids and how much breastfeeding, and how do I make sure to keep my supply going once that happens? Also, is sitting up on her own a definite MUST before I think about solids? She’s been watching me eat and reaching toward my food a little bit, but she does not sit alone unsupported and doesn’t do the pincer thing with her fingers. 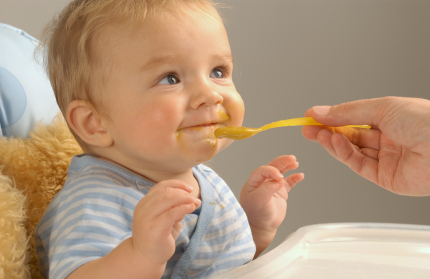 In the past the American Academy of Pediatrics used to recommend starting solids between 4 and 6 months of age. They have since changed their recommendation and now recommend waiting until your baby is at least 6 months of age to start solids. Some studies have shown that starting solids earlier isn’t advised because an increased risk of developing allergies and because the baby’s digetive track isn’t developmentally ready for them until about 6 months. Once your baby reaches age 6 months, there are several factors that will enable you to determine if you baby is ready to start solids and they include the ability to sit-up unassisted, the ability to use the “pincer” grasp to pick up small items and the absence of the “thrust” reflex which automatically pushes the foods out of their mouth with their tongue. In addition, your baby will do things like mimic chewing when you are chewing, reach out for your food and watch you intently as you eat. Nutritionally, your baby doesn’t actually “need” to start eating solids until at least 12 months. Your breastmilk provides all of the nutrients your baby will need. Starting solids earlier is really for the experience of different tastes and textures. When you first start solids, your baby will be getting a very tiny amount – 1 or 2 teaspoons 1 or 2 times per day. The amount that they are nursing should not decrease at all and you should always nurse first, and feed solids after to be sure your child is getting enough breastmilk. As your baby starts to eat more and more solids, this will be in addition the amount of breastmilk that they are drinking. Solids should not replace breastmilk until after 12 months of age. My advice, wait a little longer until your baby reaches 6 months of age and then look for cues that your baby is ready to start experimenting with different solids. You will have a blast doing it once the time is right. KellyMom has a great article on when to start solids which I highly recommend reading. 5 comments to Ask Judy: How Should I Balance Breastfeeding And Starting Solids? This came at such a good time for me. My family and I just moved, a started working full time, my husband works full time, my son who is just about to turn 6 months is at work with me with our in house day care. I feel like life is so busy, im on a whirl wind and i am missing the mark with starting solids. All the other babies weren’t 100% breastfeed like my son and started solids so much earlier. I was feeling bad, like I wasn’t helping me son to develop and not giving hin foods he needs. Reading this helped a lot. First, wait until the babe is REALLY ready. Sure, they’re curious before, but Judy gives a great description of what food readiness is – right in line with the La Leche League guidelines. For all three of mine, this was not long after 6 months… maybe 7 months or so. From that point until sometime after a year, the food was VERY little. I never measure, and never, EVER spoon-fed (until my last little, who adores applesauce!). They got chunks of mushy banana, then avocado, eventually Cheerios, etc… Self-feeding, and not much of it. I would say that the time we crossed the threshold of them getting at least 50% of their nutrition from food didn’t happen until age TWO. But why stress about it? All are big, healthy, smart, lovely people! .-= Tiffany (As For My House)´s last blog ..Nelson’s Complete Book of Bible Maps and Charts – Review =-. I second what Tiffany said. We’ve also done “baby led” solids (also known as “baby led weaning” – but that refers to weaning ONTO solids, not OFF of breastmilk) with our daughter (now 16 months). .-= Whozat´s last blog ..Daily Peep: Purple Power =-. I should add that although she will eat many, many different kinds of solid foods, she’s still (by far) primarily breastfeeding at 16 months. On kellymom, they say that a baby should get a more or less constant amount of breastmilk for most of their first year of life. So the solids would be in addition to the milk they’re already getting. Often, the baby starts getting really hungry at around 5-6 months, and they don’t seem to be satisfied with nursing or bottles alone. Keeping their milk supply steady and adding solids is a good way to add some extra calories and gradually introduce solids. Assuming they’re ready to eat, of course. In my case, DD was very ready to eat solids when we tried it at 5 1/2 months. I work, and I initially sent the baby food to her daycare provider, so DD would get extra solids during the day, and nurse at home to keep my supply up. And feeding her baby food when we were driving around on the weekends was convenient too. I forget how old she was before we regularly fed her solids before and after work too. Somewhere around 10 months to a year old? I’m sure you’ll find what works for you with some trial and error.